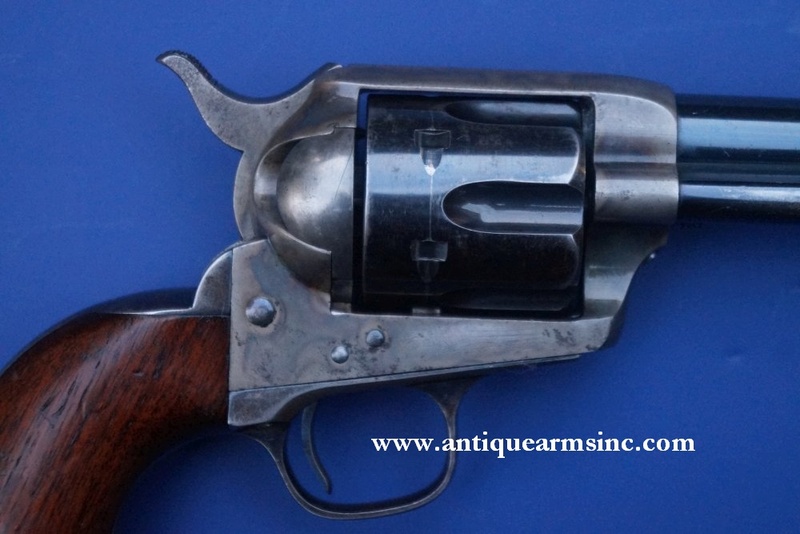 This is one of the nicest US Marked Colt Single Action Army Artillery Model Revolvers we've had in years. 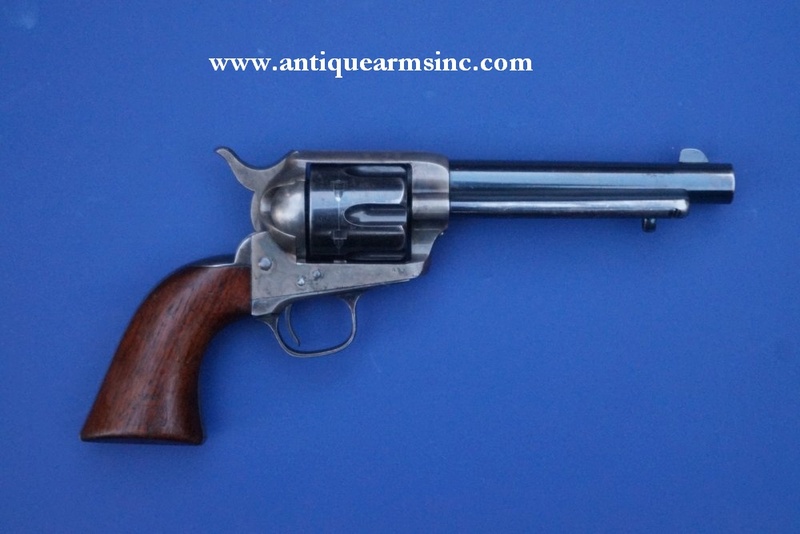 As most of you already know the story, the Artillery Models were refurbished from the Indian War Era Colt SAA Cavalry Models sent back to Colt. 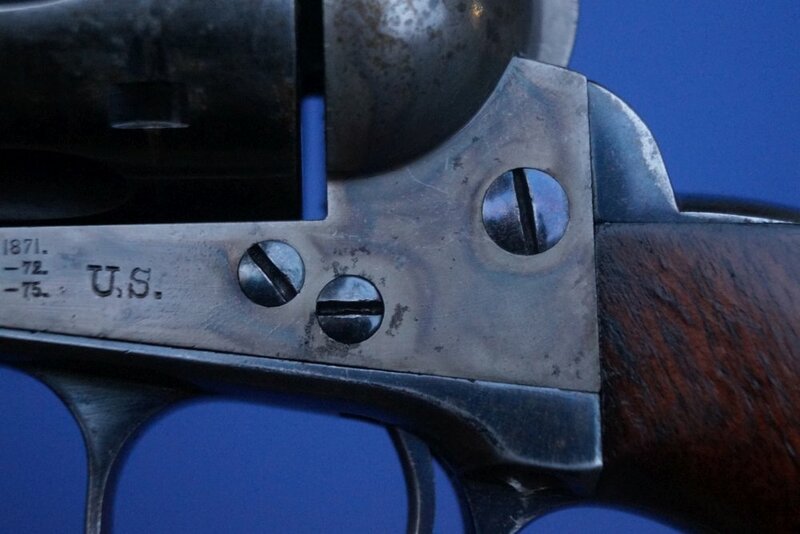 The most famous military outfit issued Artillery Model Single Actions was Teddy Roosevelt's US 1st Volunteer Cavalry a.k.a. "The Rough Riders" in 1898 for the Spanish-American War. However, where the Artillery Model earned its keep was the Philippines after the United States defeated the Spanish and took over in 1899/99. While the Filipinos were initially happy to see the Americans vanquish the Spanish from their islands, many were not happy with the idea of the US overstaying their welcome. Thus began the Philippine Insurrection which lasted from 1899 until 1913. 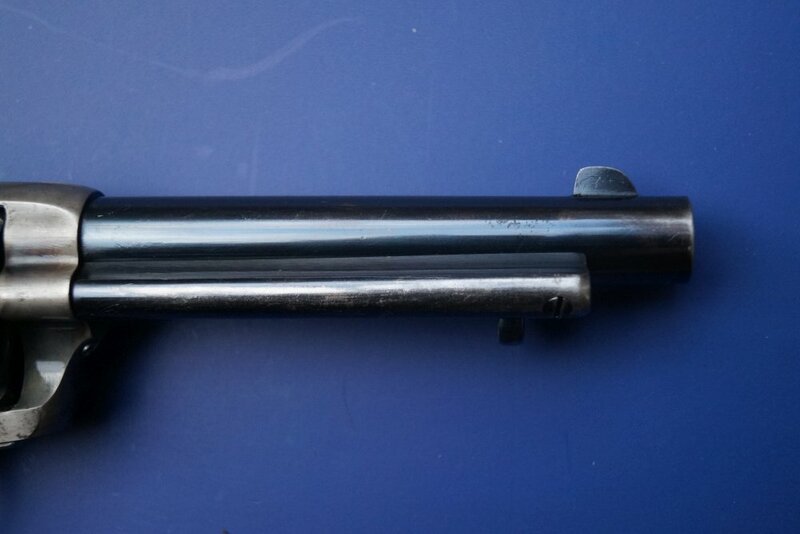 Initially, the US Army was armed with the new Colt Model 1894 .38 Double Action Revolver but these were found to be ineffective against the insurgents, especially when fighting the Moros. 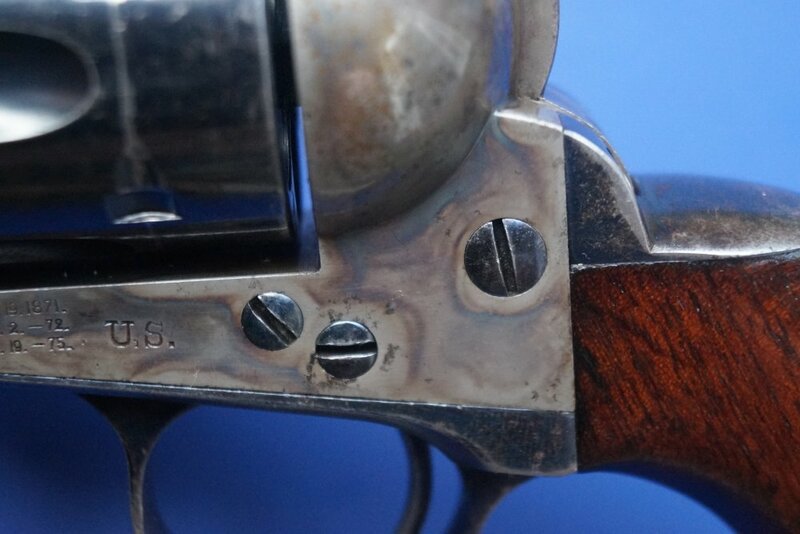 It is said that American officers were able to shoot their Moro attacker with all six shots from a .38 DA Revolver and still not live to tell the tale. 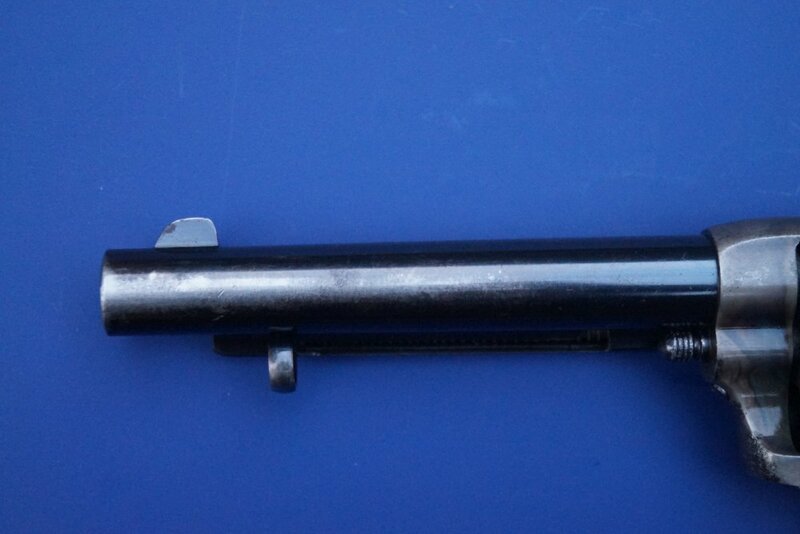 In one case, an officer went into the jungle to relieve himself and was attacked. 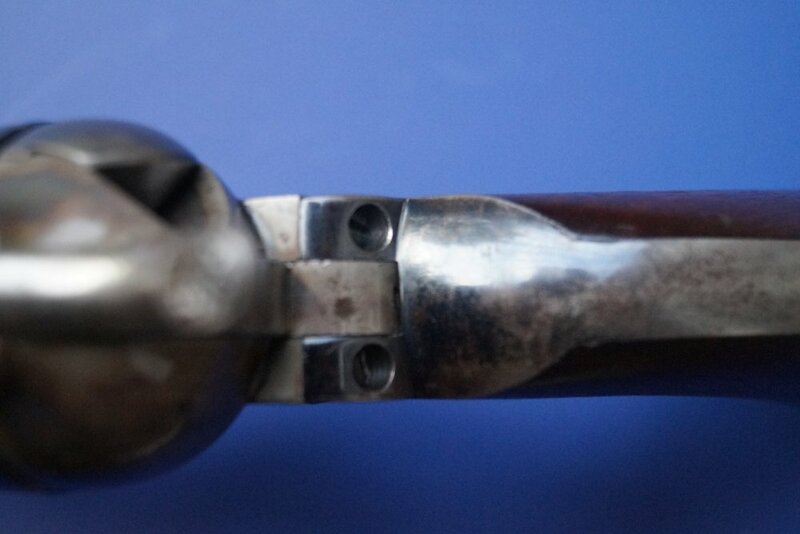 Firing in retreat with his .38 DA, his pants down, he was saved by his 42 year old cavalry sergeant who drew his .45 Single Action (which he'd carried since the Indian Wars) and ended the attack with one shot. 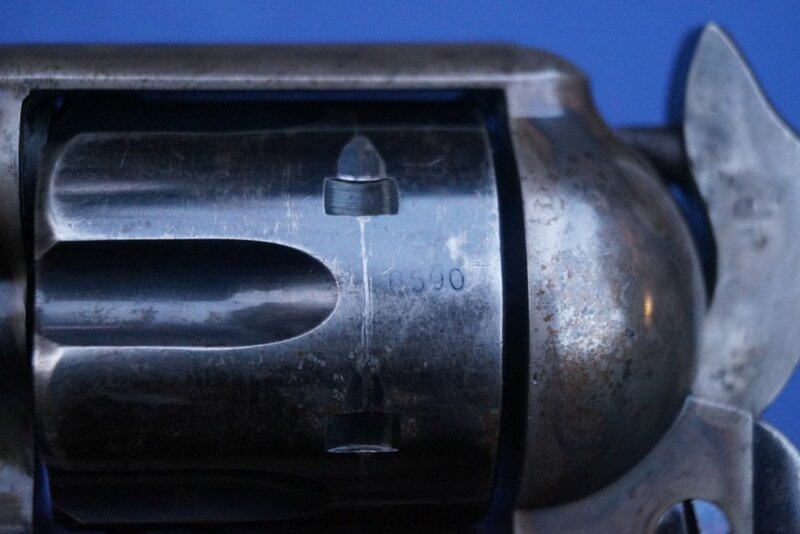 After his brush with death, the officer ditched his .38 DA and went out and found himself a .45. 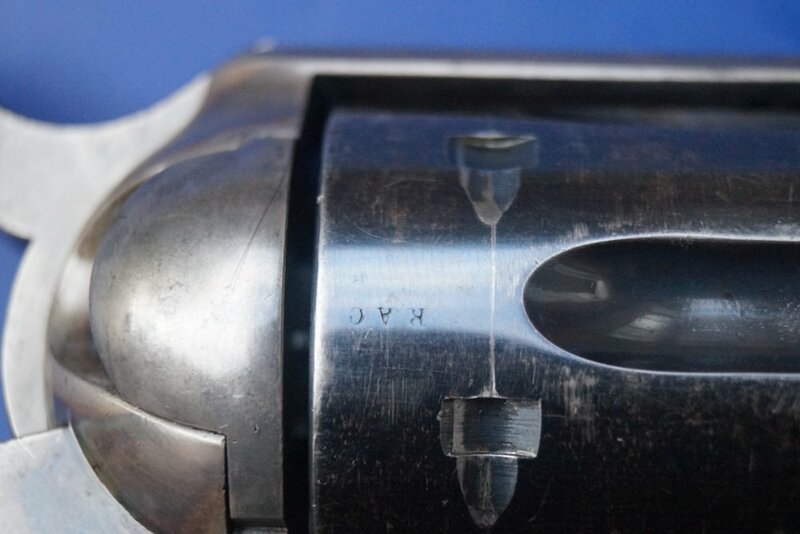 This is why the .45 Colt Single Action Army re-emerged. 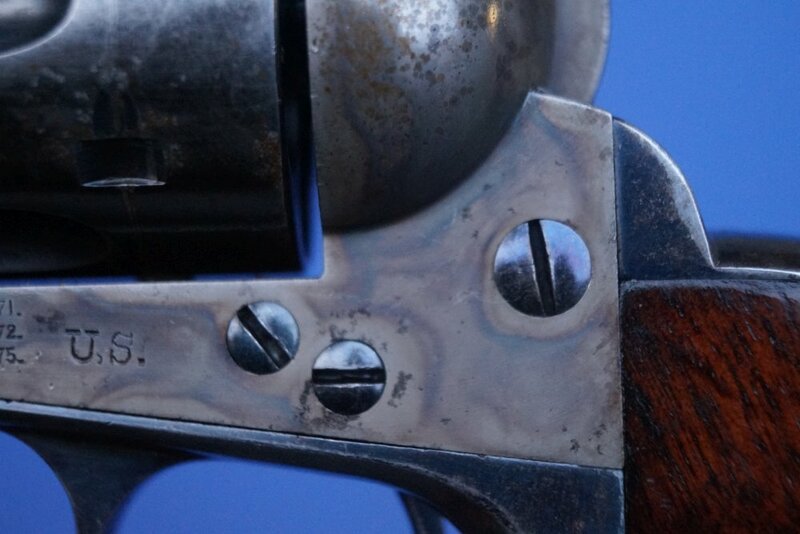 They had no problem stopping these highly motivated warriors and the Army was soon replacing their .38 DA's with .45 Artillery Models. 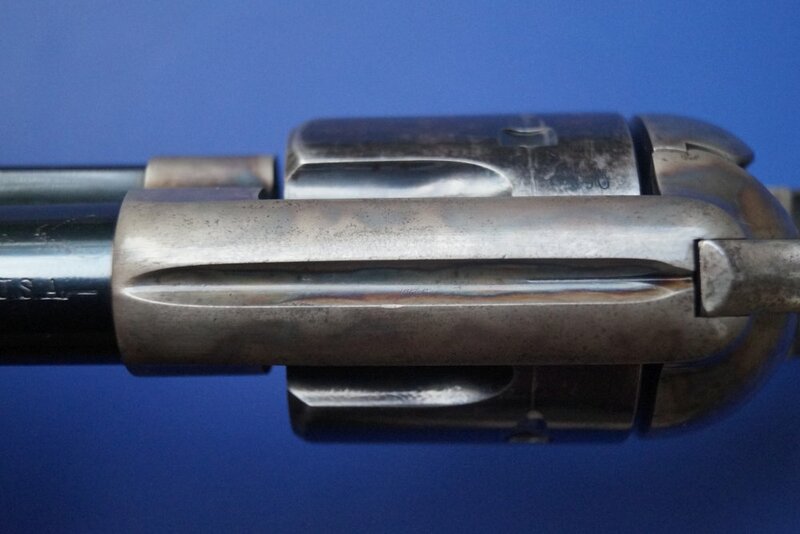 Frame is DFC inspected in the 94,000 range. 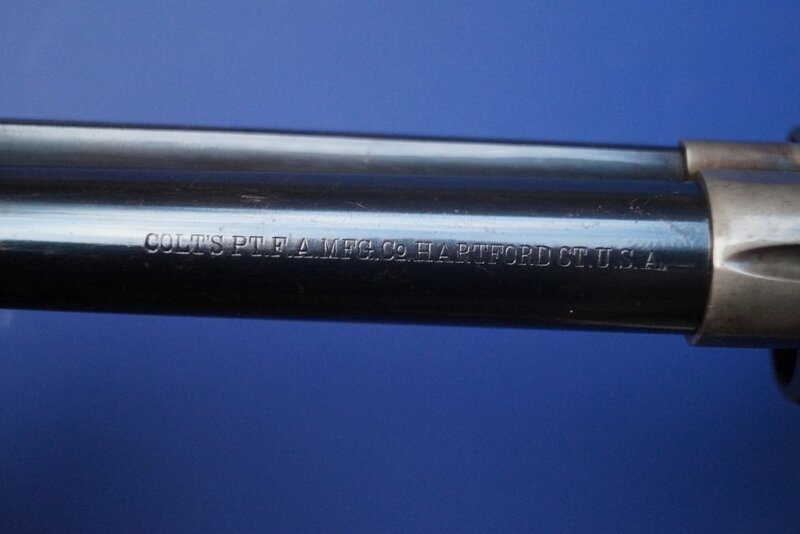 "US" stamped on left side of the frame with three patent dates. 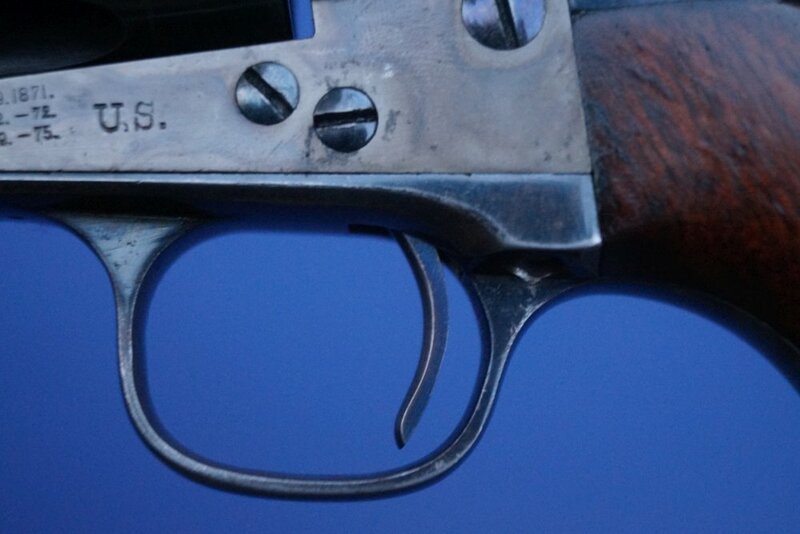 The trigger guard is in the 113,000 range with a small sub-inspector's initial beneath. Backstrap is in the 131,000 with a "K" beneath. 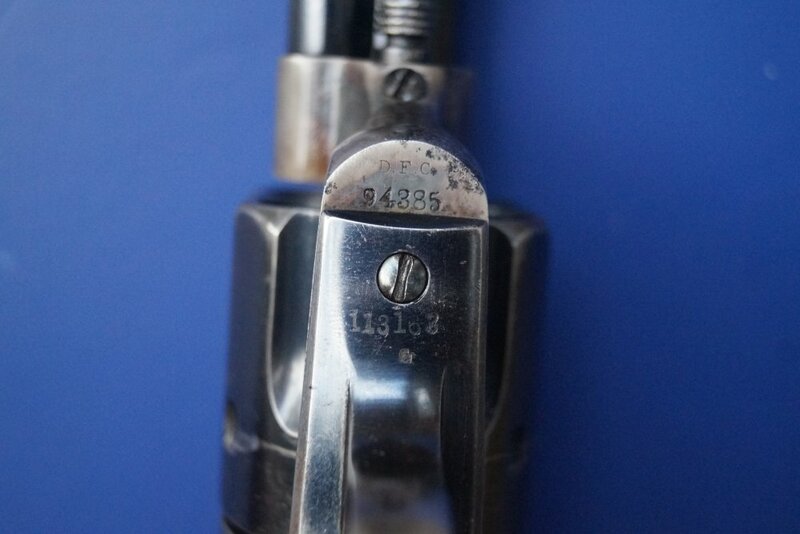 Cylinder has a four digit number 6,590 from a late serial range as it has a faint but legible "RAC" from its original configuration plus a "P" and a "K" sub-inspection. 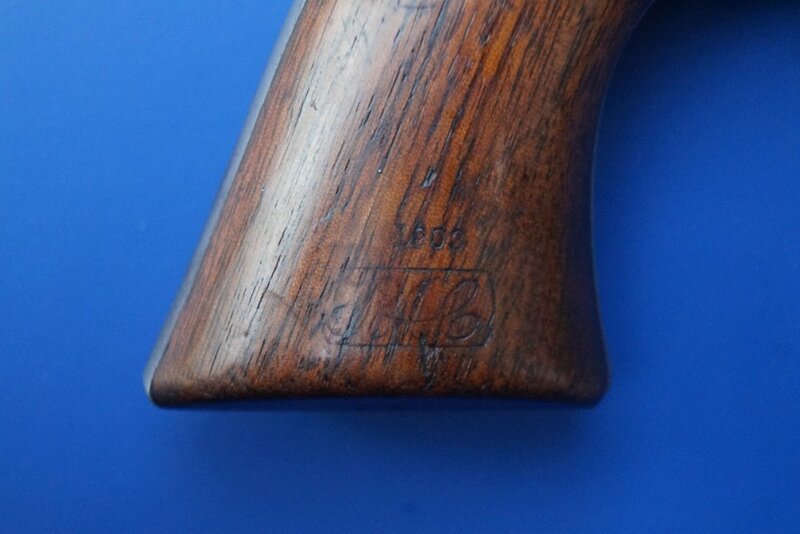 Barrel has a faint number that is not entirely legible with a faint but legible "RAC" and a "P". 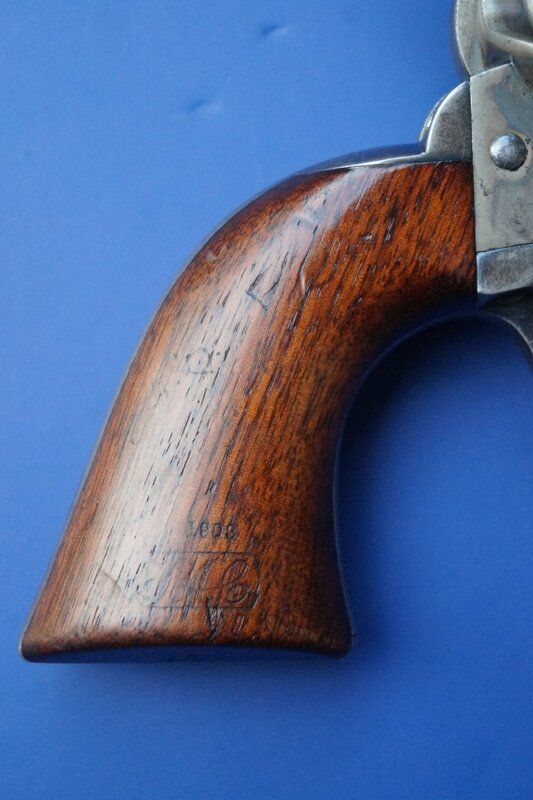 Grips have "RAC" cartouche on the right side and two "RAC" stamps on the base adjacent to the bottom strap. 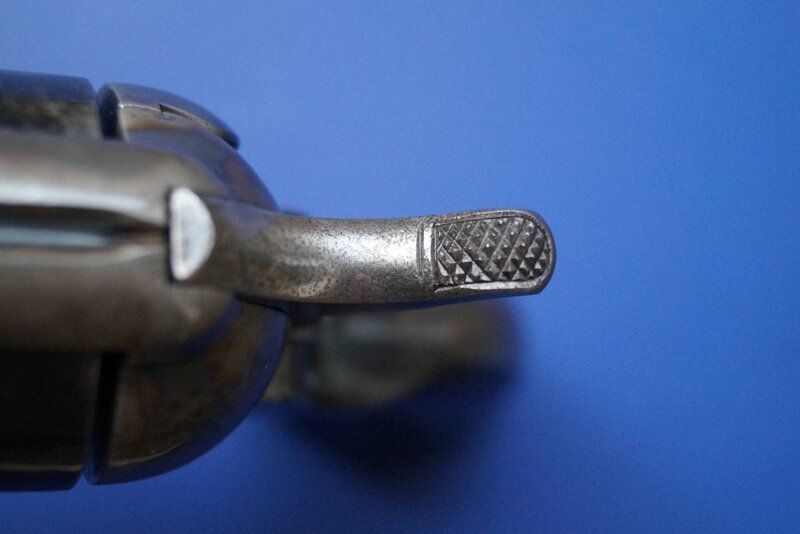 These were from an original RAC Cavalry Model that were re-purposed and re-inspected by Ronaldo A. Carr again in 1903. 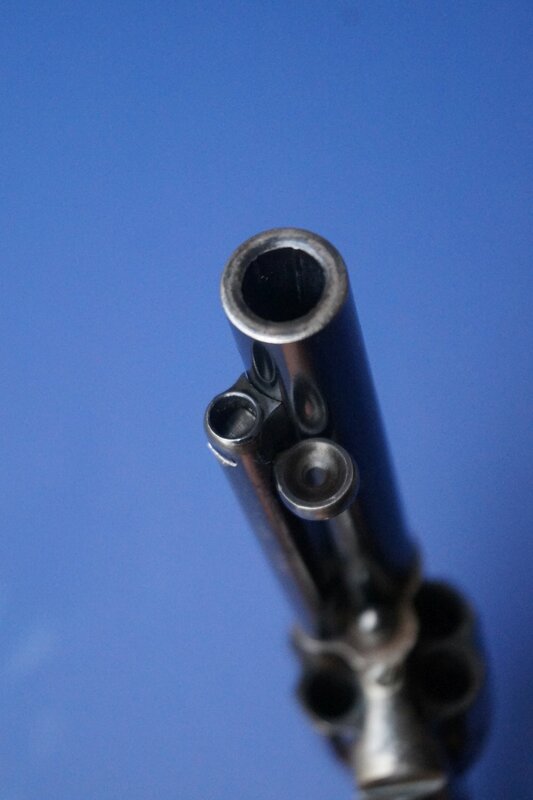 Ejector housing is the later style but with the early bullseye ejector head from the 1870's. 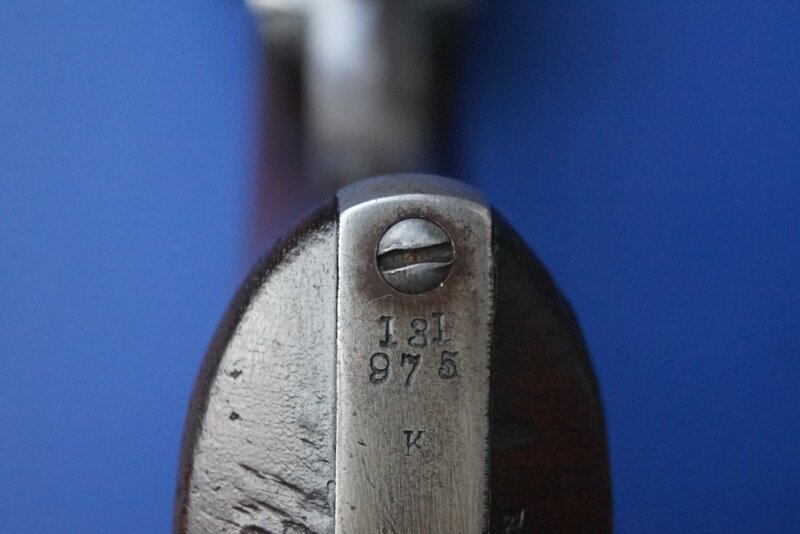 Early hammer with the long border around the checkering. 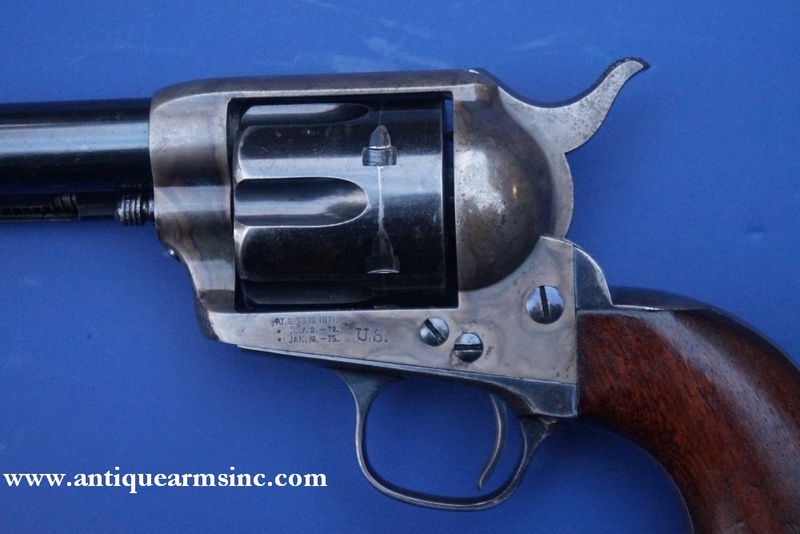 Overall, this revolver is in NRA Antique Excellent Condition with 90% original 1903 era Colt blue on the cylinder, barrel, and ejector housing. 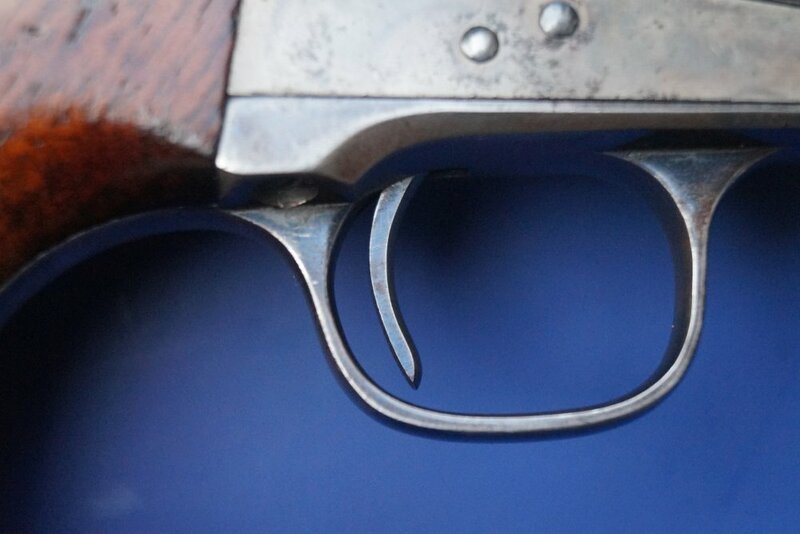 Trigger guard shows 60% blue while the backstrap is down to 20% blue. The frame 70-75% original case colors that are fading. 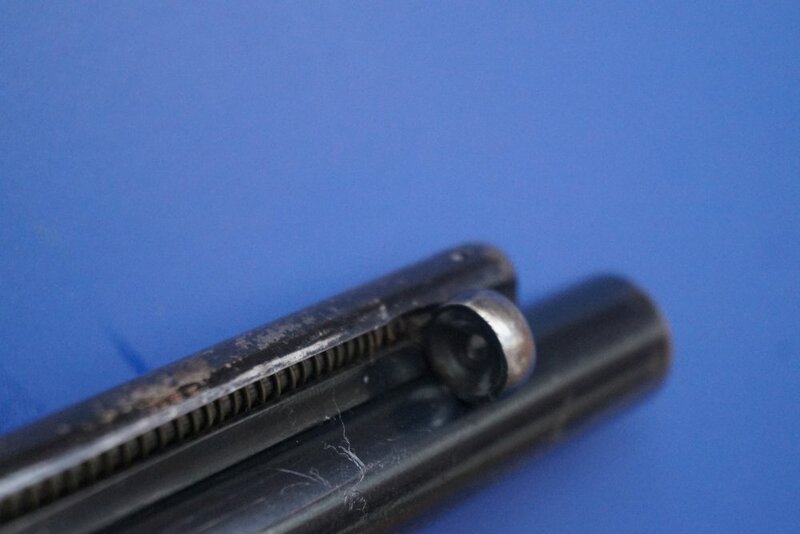 There is quite a bit of the original fire blue remaining on the screws and trigger profiles. 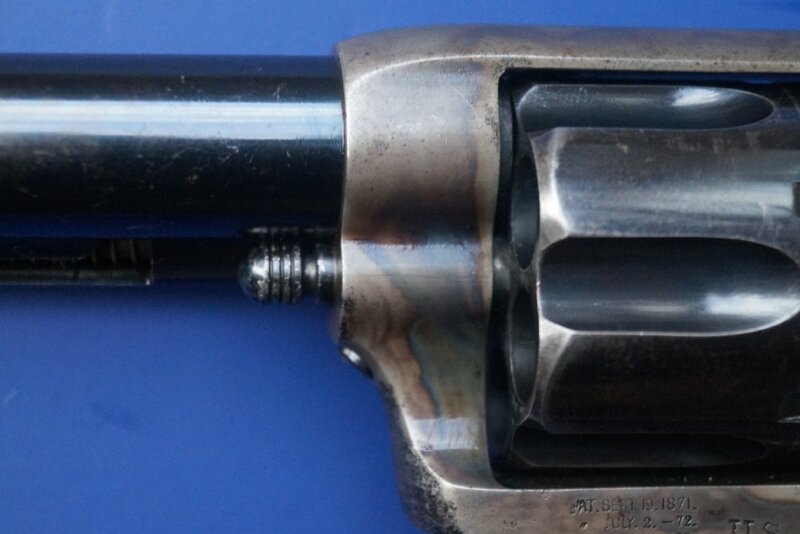 The mechanics are nice and the bore is Excellent. 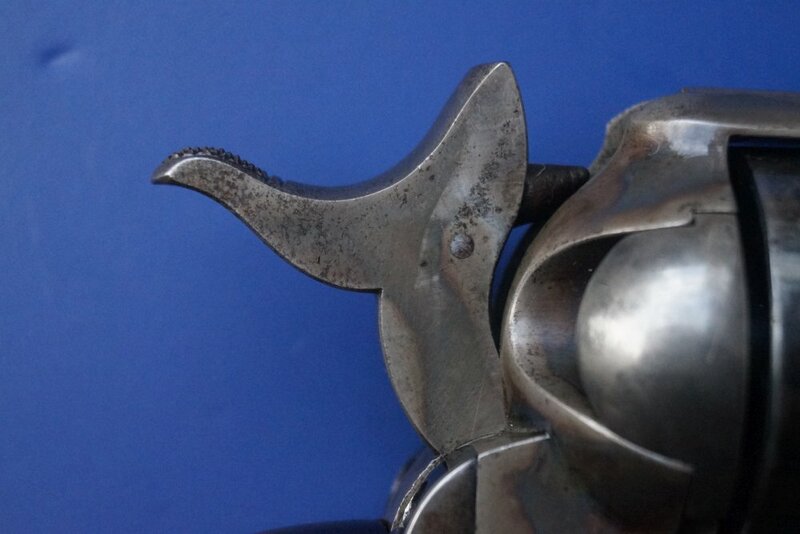 Bright and shiny. 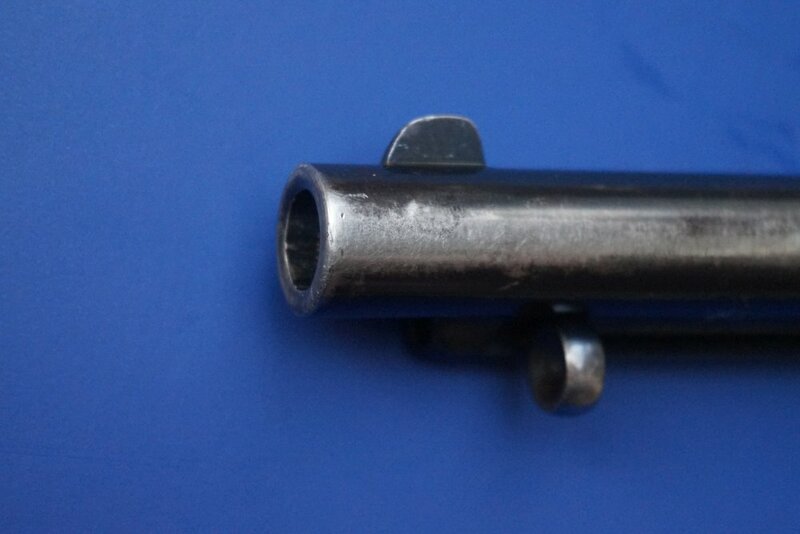 Grips are in Very Good Plus to Fine Condition Overall with nice clear cartouche and no chips, cracks, or repairs. 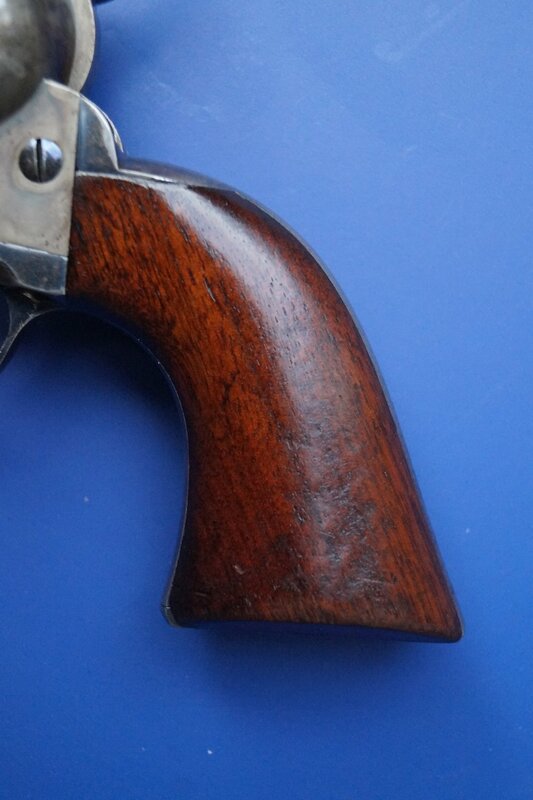 Nice wood to metal fit. 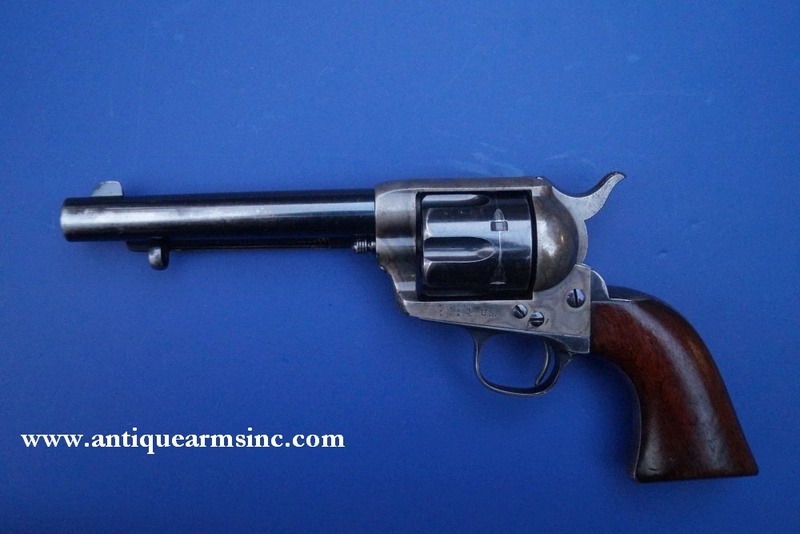 This is a really nice looking Artillery and should make a nice addition to an advanced Colt or US martial collection. We're offering this at a good price. 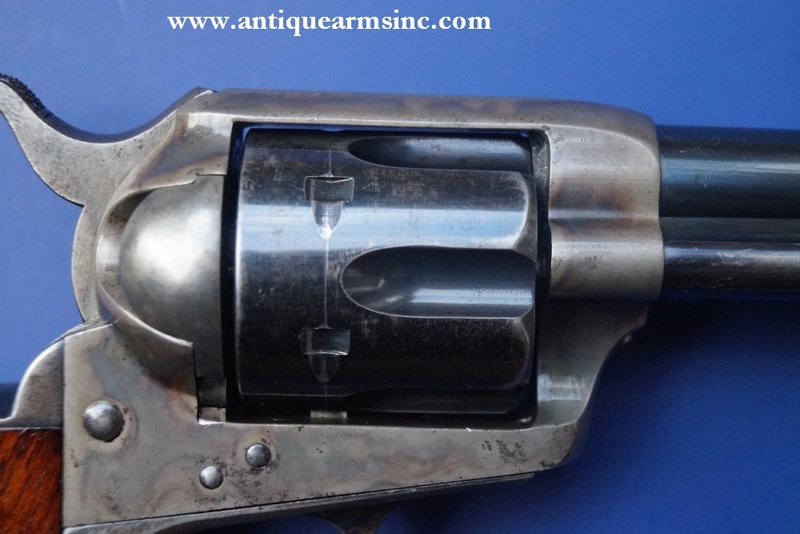 The previous owner stated that he paid $6,500 for this revolver in 2001.